Registration and course data is available on the TISS site. This course aims to give an overview of basic and state-of-the-art methods of rendering. Offline methods such as ray and path tracing, photon mapping and many other algorithms are introduced and various refinement are explained. The basics of the involved physics, such as geometric optics, surface and media interaction with light and camera models are outlined. The apparatus of Monte Carlo methods is introduced which is heavily used in several algorithms and its refinement in the form of stratified sampling and the Metropolis-Hastings method is explained. At the end of the course students should be familiar with common techniques in rendering and find their way around the current state-of-the-art of the field. Furthermore the exercises should deepen the attendees' understanding of the basic principles of light transport and enable them to write a simple rendering program themselves. The main book of the lecture (referred to as PBRT). A free course scriptum that gives a detailed explanation of the mathematical foundations of Global Illumination. References to various papers at the end of the presentation slides of unit 06. Unit 02 - The Rendering Equation and Ray Tracing (Károly Zsolnai) - Update: the full unit is now uploaded. I have also added a video around slide 300 on why the gradient of the surface gives the normal. Update 2: the placement of R in the earlier slides. Unit 03 - Global Illumination and Path Tracing (Károly Zsolnai) - Update: the full unit is now uploaded. Update2: a reference to the BRDF explorer program published by Walt Disney Animation Studios is added on slide 11. Try it! Unit 05 - State-of-the-art in Global Illumination (Károly Zsolnai) - Update: the full unit is now uploaded. Student feedbacks for 2013 are available here. - I have updated smallpaint with a lot more comments to be more understandable. - PSSMLT and Manifold Exploration MLT side-by-side render comparison, slide 218. These visualizations are lots of fun, and they are also worth a thousand words. Be sure to check them out! 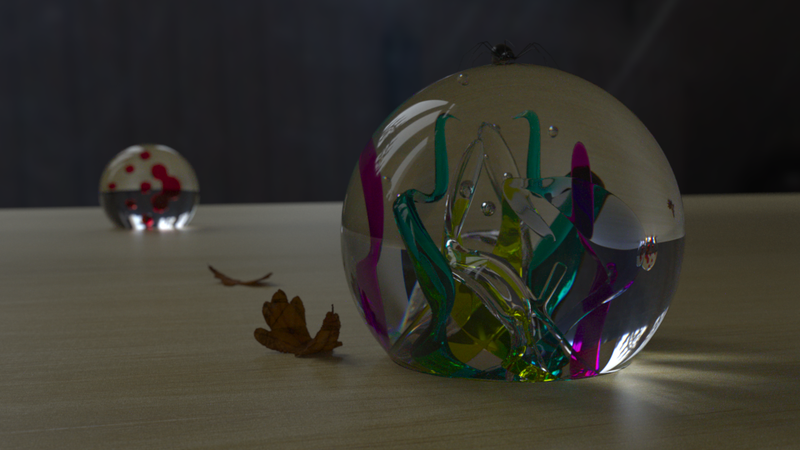 Assignment 01 - Part 1 - Ray Tracing - Deadline: 05.05.2013, 23:59. 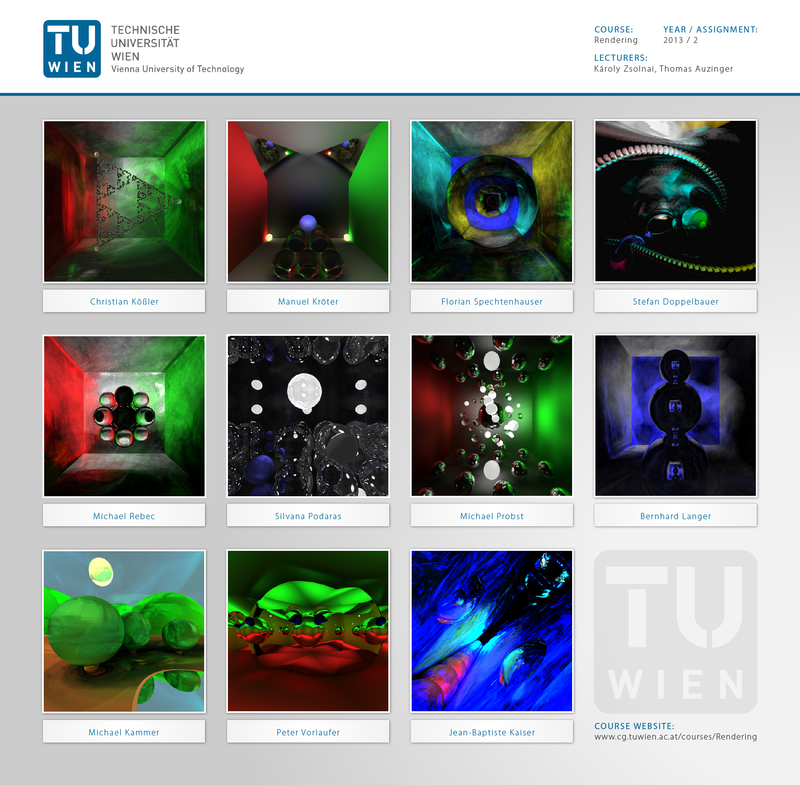 Assignment 01 - Part 2 and Part 3 - Rendering Basics and Caustics - Deadline: 05.05.2013, 23:59. Assignment 03 - LuxRender scene contest - Deadline (official): 23.06.2013 23:59. If you spot any errors anywhere on the slides, please write to us! No lecture notes are available. Last update by Thomas Auzinger on 26.02.2013. Comments to thomas.auzinger (at) cg.tuwien.ac.at.